If anyone can identify the other men in the photo, please contact me. 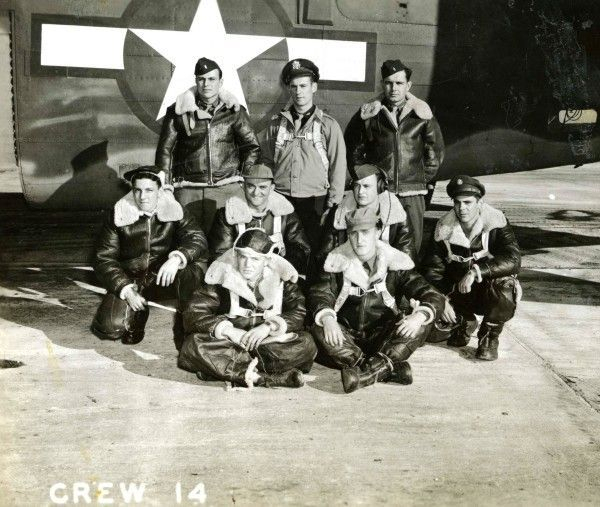 Crew 14 was an original crew in the 752nd Squadron. They trained at Tonopah and flew B-24H 41-29329 Fritzi to England in January 1944. This is a complicated crew, rather difficult to research (but interesting, nonetheless) as there were a number of personnel changes made during training and prior to flying combat. 2Lt Millard P. Schaaf, co-pilot, was pulled from this crew in early December 1943 to be the first pilot on Crew 17 after 2Lt Lawrence F. Menz was relieved from that crew. Schaaf went on to complete a tour in June 1944. Taking his place as co-pilot was 2Lt Calvin G. Cragun whose name appears on Special Orders 298 sending 30 crews (about half the group) from Tonopah, NV to Hamilton Field, CA for final processing before heading overseas. Cragun did not remain co-pilot long. He became first pilot of Crew 8 and flew the diversionary missions at the end of February 1944. He too completed his combat tour on June 6, 1944. The third, and final co-pilot assigned to Crew 14 was F/O Robert E. Boyle. Records give no indication of where F/O Boyle was previously assigned, but it appears that he was a replacement in England. 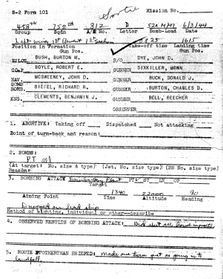 He was apparently assigned prior to March 1944, as he appears on the crew's first mission loading list on the March 6th Berlin raid. 2Lt Robert E. Clark, bombardier, was replaced at some point prior to the transfer of April 18, 1944. 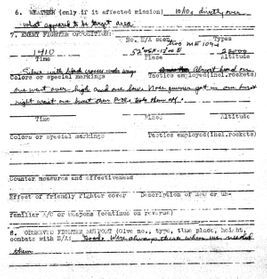 His name was confused with one of the enlisted men in the squadron, Sgt Richard B. Clark, making him very difficult to trace. Robert Clark completed his combat missions in the 752nd at some point in July 1944, having been awarded the DFC that month. He was replaced by 2Lt Richard R. Biegel, the bombardier from Crew 2. Biegel, along with Lt Bush and the majority of the enlisted men were transferred to the 329th Bombardment Squadron 93rd Bombardment Group (H) at Hardwick on April 18, 1944. 2Lt John D. McSweeney, navigator, was transferred to the 392nd Bombardment Group (H) at Wendling on April 16, 1944. He was shot down on June 23, 1944 on a mission to Leon, France. He and several of his crew evaded capture and made it back to England in early September. His replacement on the crew (if any) is not mentioned in the squadron records. 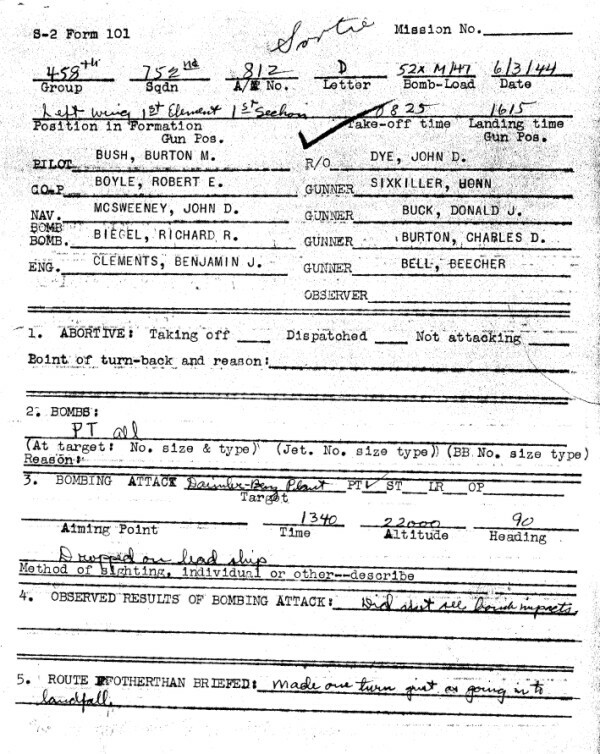 Tail turret gunner Sgt Chester Sinicki's name appears only on the December 1943, SO298 movement orders. 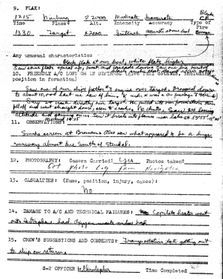 It is not known if he flew missions with the group or was reassigned. S/Sgt Carlton L. Hakanson took his place and was transferred with the crew on April 18th. Crew 14 did manage to fly nine missions with the 458th between March 6th and April 11th 1944. Their first mission to Berlin must have made quite an impression on the crew. 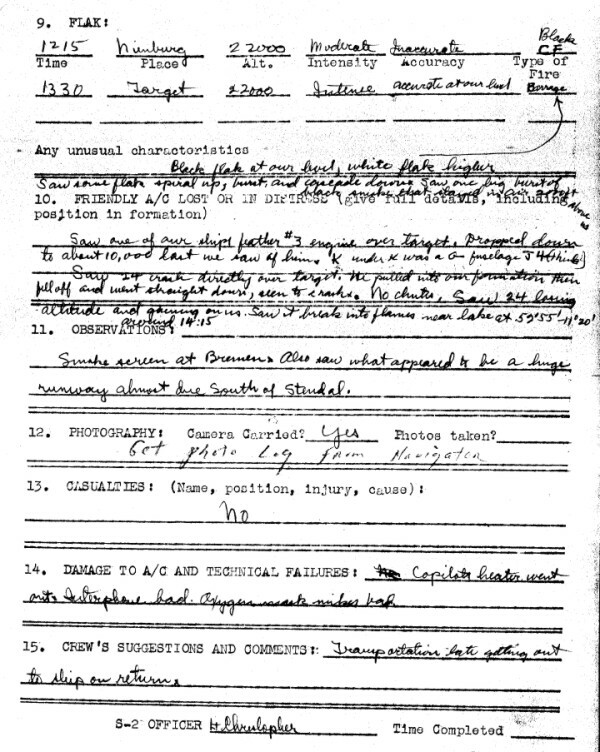 Their debriefing form was filled out very meticulously by the debriefing officer upon their return (see below). On these nine missions, Lt. Bush flew twice as deputy lead and three times as lead. The April 9, 1944 mission to Tutow, in which the 458th lost four B-24's to fighter attacks, was one of these lead missions. His crew did come back on June 10, 1944 to lead the group to an airfield in France near Chateau dun. Bush flew the aircraft in the foreground, B-24J-105-CO 42-109812 7V, on the crew's first five missions, two to Berlin. The lead ship failed to take off due to a plug change, so the deputy lead ship took over. Take off was on time and was accomplished by instrument. The Group assembled over Splasher 5 at 7,000 feet. Due to scattered clouds, assembly was slow and the briefed altitude could not be maintained. I flew for several minutes off course due to a misunderstanding over the interphone which put us behind time. Overcast was encountered in the North Sea and the Group climbed through scattering the formation considerably. Three ships became estranged from the Group and flew with other Groups. The formation assembled again very quickly, considering conditions. At the rally point, again due to a misunderstanding between the lead pilot and navigator, the briefed course was not followed and heavy flak was encountered to the right of the Group. Friendly fighters were observed all the way to the English coast. The SCR 522 set was out of commission during the entire flight, and the liaison set failed just after the target. The C-1 Automatic Pilot could not be used at any time during the flight as it was erratic. 1. 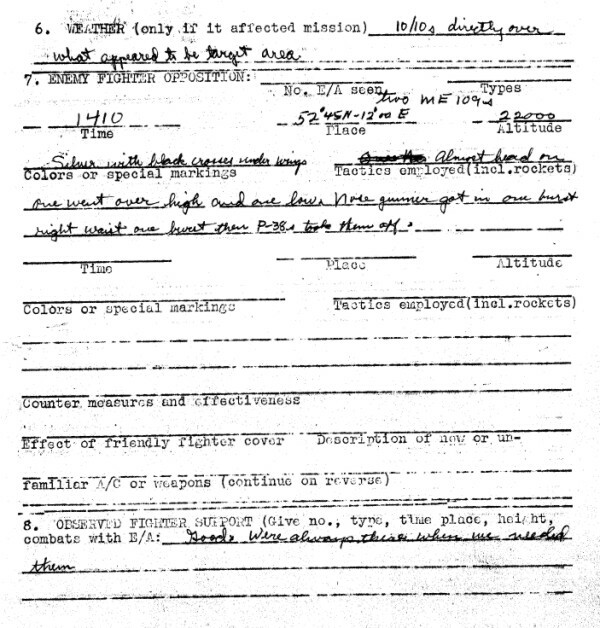 The undersigned was command pilot, leading the 458th Bombardment Group on the mission of 9 April 1944. 2. The Second Bombardment Wing was scheduled to lead the mission with three groups. The 96th Wing, composed of the 458th and 466th Bombardment Groups, was supposed to fly to the left and almost abreast of the Second Bombardment Wing. 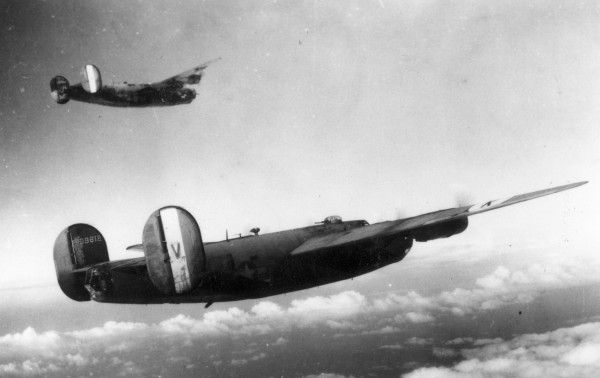 The 20th and the 14th Bombardment Wings were following these two wings in a similar formation at a four minute interval. 3. Take-off was scheduled at 0740. Assembly was to be at 7,000 feet for the 458th Bombardment Group and 9,000 feet for the 466th Bombardment Group over Splasher 5. The Division assembly pattern was from Splasher 5 to Splasher 7 to Buncher 5 and return to Splasher 5. 4. I signaled for an instrument take off procedure at take-off, as the estimated ceiling was from four to five thousand feet. Upon reaching Splasher 5, I discovered that the ceiling was considerably higher than previously instructed. I circled Splasher 5 up to my assembly altitude. After circling for ten or fifteen minutes, a thin cloud layer began to form at 7,000 feet over Splasher 5 and to the West. As the undercast gradually thickened, I climbed up to approximately 8,000 feet and the group continued its assembly. Above this layer was an overcast at approximately 9,500 feet. At this time I could not see the 466th between the layers. Thin overcast appeared to be very heavy over the channel and it was unlikely that we would be able to climb through it in formation. 5. Since it was clear to the west, instead of returning to Splasher 5 at 7,000 feet as briefed, I decided to gain altitude on the assembly route because of the above mentioned weather. I did not make contact with the other groups in the Division on the assembly route because of this change in altitude. As I departed Splasher 5, on course, another group took a position off my high right, which I assumed to be the 466th. Through a break in the clouds below me, I saw a large formation of planes which I assumed to be the Second Combat Wing. I continued on course, thinking that when we reached an area of improved weather I could take up my proper position in the formation as the Second Wing started climbing. At this time there were approximately twenty-six (26) planes in my two sections. 6. About two thirds of the way to our estimated landfall at the enemy coast, I ran into what appeared to be a thin layer of haze at 15,000 feet. I started climbing but this layer rigidly thickened and resulted in my two sections being broken up. Immediately upon breaking into the clear, I had yellow-yellow flares fired but managed to gather in only half of my original number of ships. The 466th had been above this layer and immediately assumed their original position on my high right. At this time I noticed another large formation flying high right on the 466th. I later found a great number of these ships were of the Second Combat Wing. 7. We made landfall twelve minutes late and I could not see any other groups ahead of me. My V.H.F. equipment was working poorly and I was unable to establish communications with the other wing leaders. The only friendly fighters seen at this time were four P-47’s which appeared to be returning to England. About thirty (30) minutes after making landfall, we were attacked by approximately twelve (12) FW-190’s which made passes from 11 o’clock and 1 o’clock high. Their strategy was to attack the lead ship and work back over the entire formation. I received two (2) twenty (20) mm hits and numerous bullet holes, but there were no casualties; the plane continued to function normally, except for a slight looseness in the rudder controls. This attack lasted for 24 or 35 [sic] minutes. After this attack, enemy fighters were not seen [again]. No friendly fighters were seen during this attack; probably because we were twelve (12) minutes late at our rendezvous. 8. The remainder of the flight to the target was uneventful. Our bomb run was visual but slightly erratic, due to the looseness of our rudder controls. Results of bombing are unknown at this writing. The return to base was on the briefed course, but still twelve (12) minutes late. Friendly fighter support was excellent. Upon reaching the base, contact let-down was accomplished through breaks in the overcast and landing was uneventful. 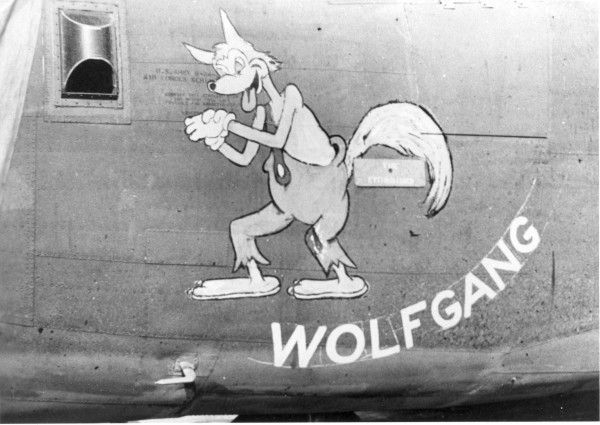 Four ships of the 458th Bomb Group failed to return from this mission.